You may have noticed that The Glutton’s Kitchen has a new fancy header – a brilliant paper cut artwork made by the very lovely and super talented Jane Steger-Lewis of www.ilovemayo.com. In addition to amazing paintings of her roosters, Jane produces a Love Ireland range of gorgeous contemporary prints inspired by Irish blessings and culture which I am huge fan of. I particularly love this big bright quirky print, which looks fab in a white frame and is guaranteed to bring out the Mrs Doyle in anyone. To celebrate my brilliant new blog header I am giving one of Jane’s Aw Go On prints to one of you lovely readers. To enter simply leave a comment below. Post to Irish or UK addresses only. Closing date Friday 27th January 2012. Winner will be selected by random number generator thingy. UPDATE!!!!! So sorry for the delay in finalising this comp. Using random.org the winner is 3!! This is the best I could do with cutting and pasting number generator – by my reckoning the winner is Sharon Ni Chonchuir :) congrats – email me your address to gluttonyforbeginners@gmail.com and I’ll pop it in the post to you. Around the web in 20 clicks...In "News and Reviews"
Itsa Cookbook by Domini Kemp (Gill & Macmillan)In "News and Reviews"
Wow-ee! How cute. Oodles of talent swimming around here ladies. but my favourite favourite colour is RED and I would love that tea towel! It’s a poster Mona. I’ve tried to get tea towels made of my design but can’t find anyone in Ireland to do it (also my Ireland papercut Ireland maps). If anyone knows of anybody, please let me know. I love the banner and I’d love this print. I’ve spotted it before and it’s been on my wish list for a while. Thanks Sharon :) I have my eye on a few more bits from Jane I must admit. Gorgeous stuff. It’s beyooooooootiful. That is all. Much as I utterly adore my own site background, I am coveting yours! Hi there – I have to agree, love all of Jane’s work especially the paper cuts as they are so unique! I love the new header, it’s beautiful! 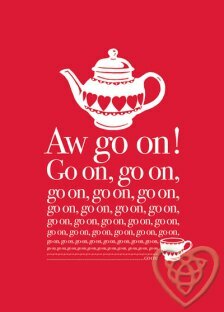 And I love the Aw Go On print, I saw it when I was Christmas shopping and was seriously tempted to get it for myself but I had to prioritize! Hi Breige – the print is fab, so many admire it here. Looks great up. As I may have already mentioned on the ole twitter machine – I love your new look! Thanks Emz :) I’m so pleased with it. Jane is an absolute star. Would look fab in kitchen – when are you moving in? 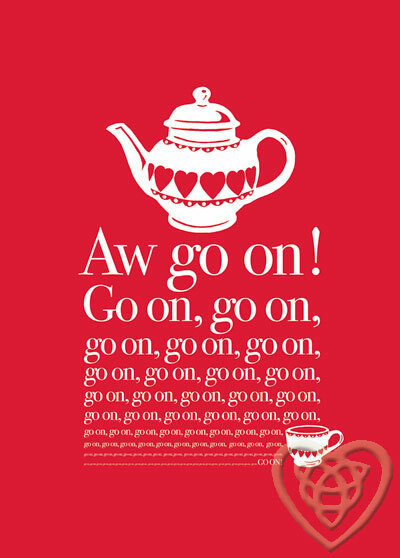 looks fab & the print too – Article in Powerscourt Town house in town have some teatowls & aprons that would have those sort of prints….maybe they might know where you could get them done in ireland? Thanks Niamh for that tip – might be somewhere for Jane to explore. Oops , thought it was a tea towel, theres an idea for you, would be great as one too. It is really fab. The print kind of sums me up in a nutshell too. Jane wrt to the printing of your tea towels you’d nearly be tempted to get a fabric printer & do it yourself! Hi there :) it is a fab print isn’t it? Such a gorgeous colour. As I said already, FAB-U-LOUS! Would love to win the lovely poster. Please pick me random number machine, aw go on, go on, go on, go on! Hahaha :) no trying to butter up the number machine now! Ah you will, you will, you will, you will………pick me!!!! really loving the new header. SO fab! Hi Edel :) LOL…we’re all a little bit Mrs Doyle deep down really. Thanks a mill – Jane did amazingly well didn’t she? Thanks Kileen, that’s great to hear – I love all of Jane’s Love Ireland range. Love that header. So pretty. Have had my eye on the I love Mayo site for a while. I love her paper cuttings. I would love that for my bare walls here. Although I spent the ten years before I left Ireland in Galway, Born in Mayo, those rocky, hilly, fields, are the stuff of my dreams. I know I am much farther away than the U.K. but my Mayo mammy would be willing to send it on if I am allowed to enter. Ah go on……..
Brenda, of course you are allowed – once I have a UK or IRL postal address to send on to it’s all grand :) I have this up on a big wall and it looks great I must say. Hello MK :) thanks so much – I’m so pleased with it. Jane is a super star! LOL Maggy – that is exactly what Jane is alright :) Hope you and those pooches are keeping well! Thanks Becs :) oh I haven’t seen any laser cutting – much check that out. Our Jane here does it all by hand – clever lady. Love the header and love the print, so well done! Thank you Deb :) delighted with it. So sorry for the late reply Aoife – have been MIA from the blog for a while. Thanks so much for the lovely comment – Jane is so talented.